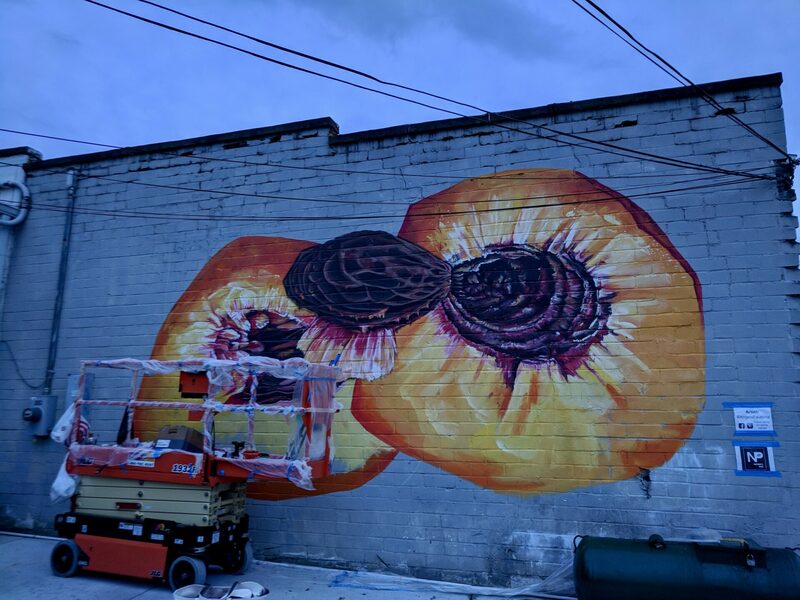 This spring, I was one of the artists commissioned by the City of Marietta to create a mural that reflects the area. 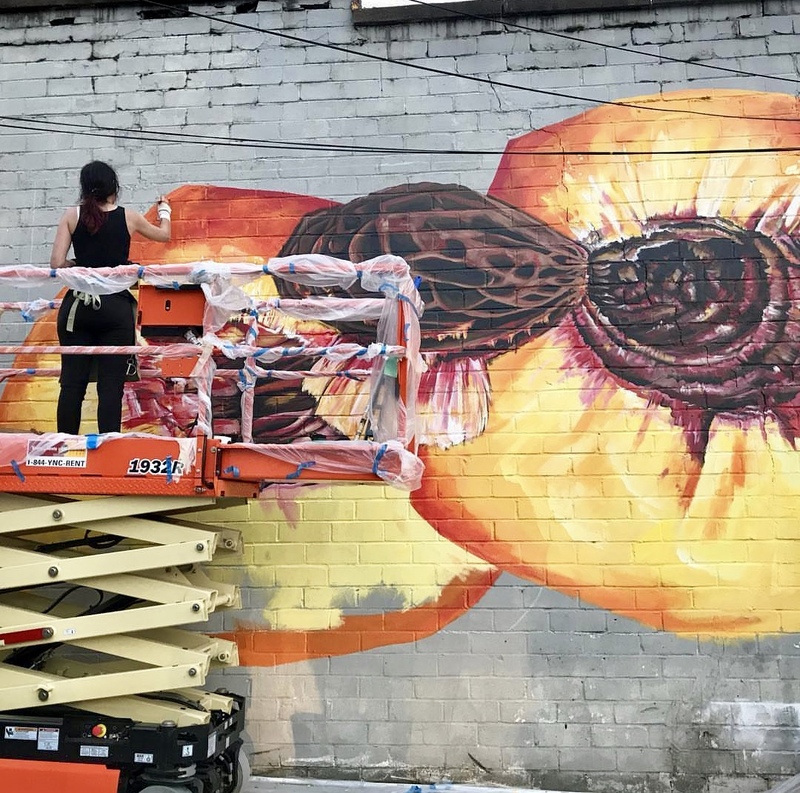 Meet PEACH III, my biggest painting to date! Here it’s photographed by Lindsey O’Shields. 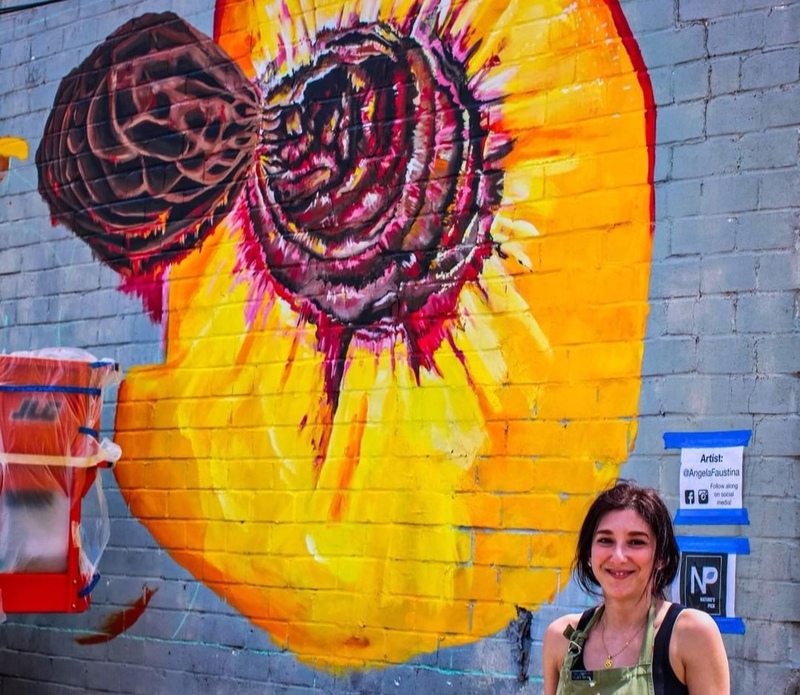 The murals and other public art installations and performances are part of the inaugural M2R Trailfest, a two-day celebration of Marietta’s new Mountain to River Trail. 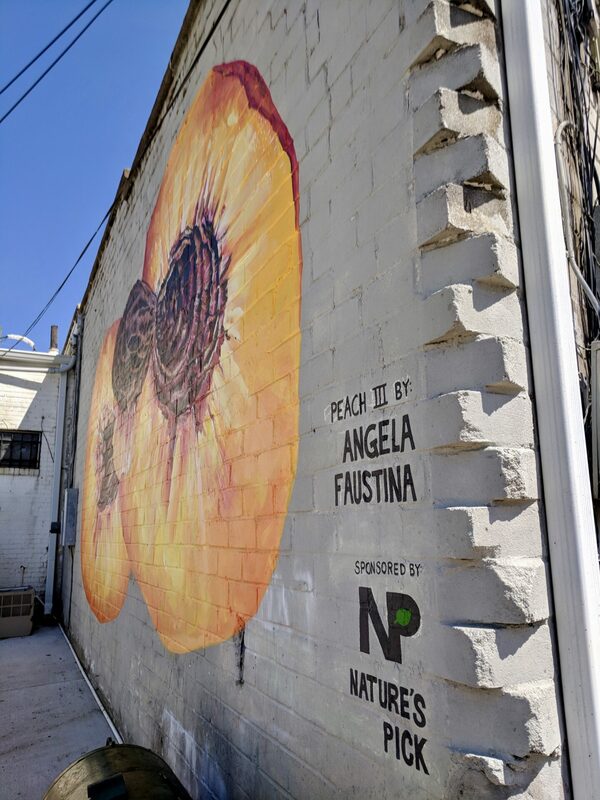 My mural proposal was awarded by the Marietta Arts Council and sponsored by Nature’s Pick Market, an amazing health foods store just off Marietta Square. 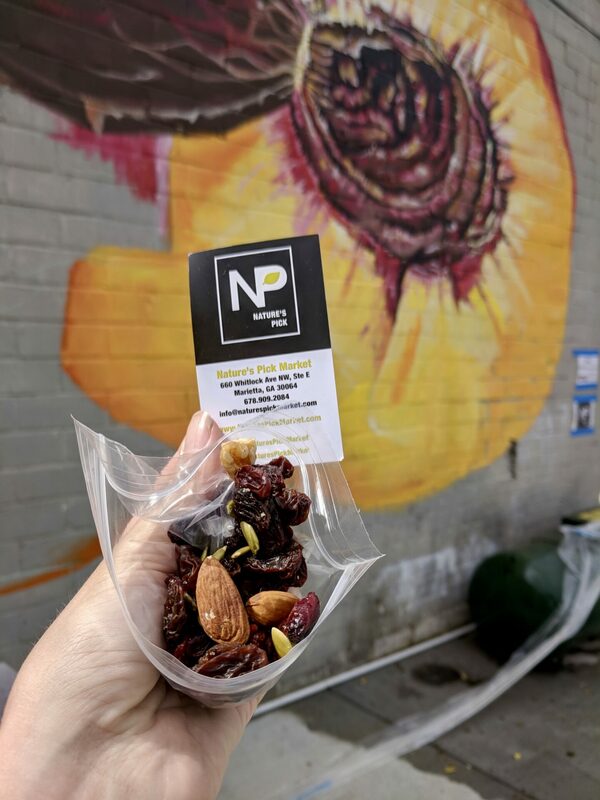 They also provided delicious trail mix to celebrate the M2R Trail on opening weekend. Photograph by Michael W Thomas. It was a pretty stellar experience. I’m thrilled I met so much of the community, made new friends, learned from artists I admire, and figured out how to work the lift! I was especially thrilled to meet two particular artists who were also participating in the festivities – the amazing painter and muralist Lindsey O’Shields who took the main photo in this post, and Michael W Thomas, an incredible photographer who captured the photo above. Saturday marked the first day of the first annual TrailFest, Marietta’s celebration of the newly opened Mountain to River Trail, which runs from Kennesaw Mountain, continues through the Marietta Square, and ends at the city limits on Atlanta Street. 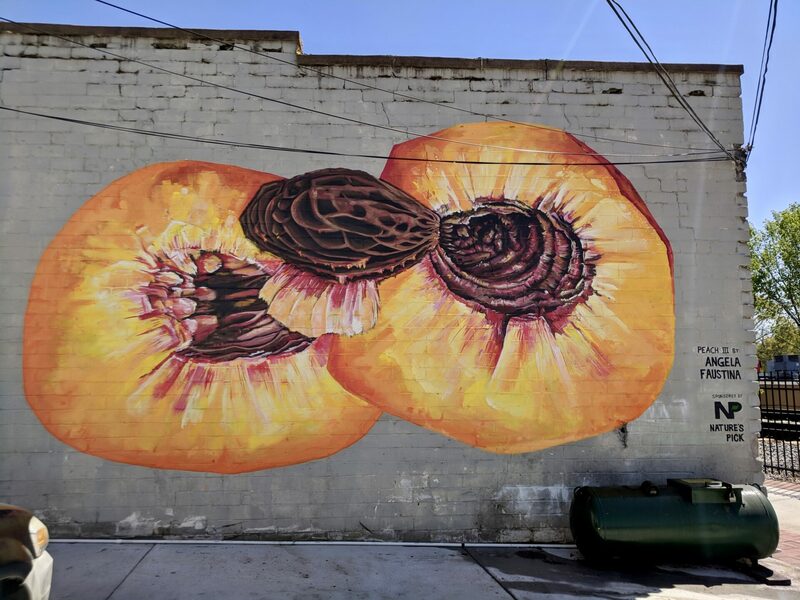 Marietta partnered with local artists and the Marietta Arts Council to put murals, sculptures and other art installations from Marietta Square through Atherton Square and alongside the new trail. The M2R Trailfest has gained a lot of press so far. 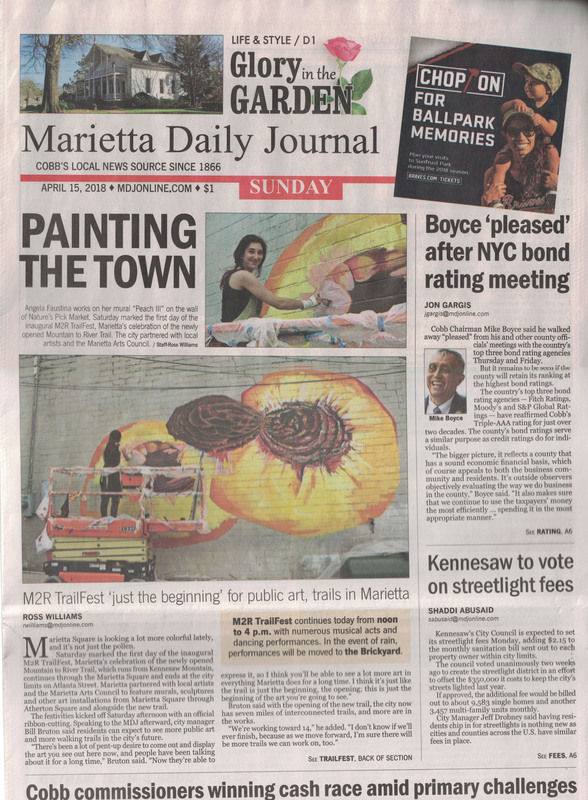 My Peach III mural was on the front page of the Marietta Daily Journal as well as the front page of the lifestyle section of another North Georgia paper. If you haven’t walked the art-4pm Mountain 2 River Trail in Marietta yet… What are you waiting for??? ?